NaNoWriMo is like 16 days away, you guys. I met with my writer’s group on Saturday. I know, it’s hard to believe that I was able to do anything after Friday night’s rager with Nyquil and tomato soup. But I did. I rolled out of bed, didn’t shower, put on what has become my weekend uniform (leggings, comfy shirt, afghan-looking sweater, thick socks, legwarmers), and went to the cafe to meet with my group. We usually start the two- sometimes three-hour meeting by going around and saying what we’re reading, then going off on random tangents about books, authors, genres, or tv shows. Eventually we start the discussion of any work submitted for discussion/workshopping. I submitted a character sketch titled “Ruby”. I claimed it was flash fiction, but the only action that occurred was her carving a linoleum block, so I suppose as far as conflict goes, it was pretty dull. I got some good ideas for expanding on the character and have since started toying around with a few character exercises where I put Ruby in different scenarios to see how she reacts. I know that’s a little strange – trying to see how this character I made up reacts to conflict. But really, what else is fiction but trying to figure out the people in our heads? Anyway, we ended up talking about National Novel Writing Month. It seems like a great endeavor, really. Writing a novel in a month? How awesome would that be? The point is to write 50,000 words in a month, which amounts to about 1,600 words a day. Not too bad, right? Of course not, until you get in the thick of it. I would love to say that I’ll be participating this year, but I know I won’t be. I’m starting a new job that is training-intensive, working overtime, working out, maintaining a blog, trying to have a social life, AND reading Infinite Jest. Just where am I suppose to find time to write 1,600 words every day? I’m sure I would be able to find the time if I really wanted to do it, but I don’t. Maybe next year. Anyway, the whole reason I’m writing this post is because I think you should all follow Fake NaNoWriMo Tips on Twitter, especially if you’re a writer who isn’t participating in NaNoWriMo. I suppose it could provide some comic relief if you are participating, but let’s be real. You’re not. Also, while you’re at it, you can follow me on Twitter for some Everything is Blooming microblogs. 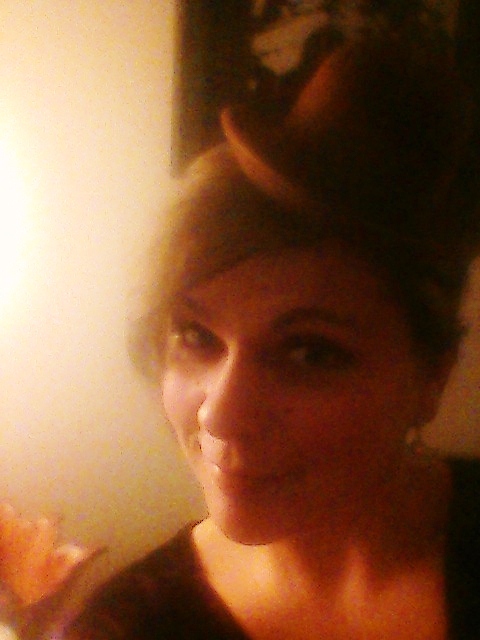 I couldn’t think of a picture that would go well with the post, so here’s a grainy picture of me in a miniature bowler hat at the Christmas party my friends and I had last weekend. Yes, you read that correctly. We had a Christmas party. If you’re interested, find out more about National Novel Writing Month here. I’m told you can register and find (support?) groups in your area.